Carat will be our focus, so we are targeting a diamond in the range of 1.2 Carat and above. Color will be set at a maximum of J. This is a little higher than what we normally choose, but in order to fit a stone of that size, we need to compromise. Right off the bat, we are down to four stones. All large and beautiful, but with flaws. Next, we'll minimize those flaws and pick the winner. Sometimes when choosing a diamond, the best alternative is readily visible. This happens to be just such an occasion. Oval - 03 is the only diamond amongst the four to have Excellent Polish & Symmetry. If you recall from reading our page on Cut, a Diamond's Cut rating is the most important factor to consider. Beyond the Excellent rating we can see that Oval - 03's other factors are rather outstanding as well. The Diamond has a perfect 1.50 L/W Ratio, a near perfect Table %, and an excellent Depth %. It's drawbacks appears to be a slight inclusion on the Table, which is visible above 10x magnification. Making essentially invisible to the naked eye. Plus, the Diamond's Girdle is Medium - Extremely Thick, which is normally avoided. But, given that we have to compromise somewhere, that is a feature that is easily overlooked and can be minimized with the proper setting. 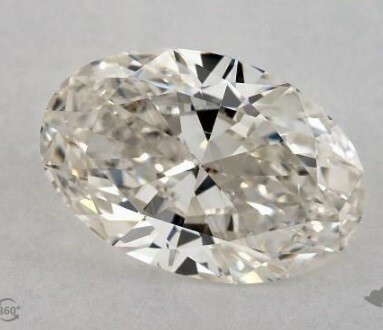 So what is the best Oval Diamond for under $4,000? Since we are trying to maximize Carat size, some compromises must be made. 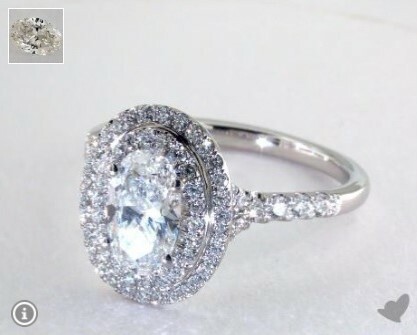 The diamond we chose has wonderful ratings with the exception of some very lesser characteristics. While $4,000 is a lot of money, as the Carat size increases you'll see that prices can mount exponentially. Plus, as a diamond increases in size, the chances of finding a Colorless diamond, or near to no inclusions diminish. Ultimately, the diamond we chose is an amazing value for the price and would bring to any engagement ring a high degree of brialliance and presence.